A large and complex space mission such as Herschel requires the collaboration of the brightest and most experienced scientists from many countries. The SPIRE instrument team in England is in fact a group of less than ten people; therefore getting expert help is critical. 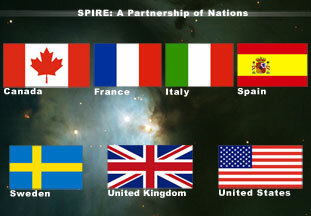 Many partner institutions from Europe and North America work together on SPIRE. All countries involved in the Herschel mission contribute staff to the instrument test and control teams. Canada funds two positions at the Rutherford Appleton Laboratories in England, where the SPIRE instrument is assembled and tested. The international nature of the mission creates great opportunities for students from the University of Lethbridge, allowing them first-hand experience with a space project. Two graduate students spent six months in England at the SPIRE verification facility in the first half of 2004. Summer and co-op students at the University of Lethbridge are involved in problem solving for the SPIRE project on a regular basis. Countries involved with the SPIRE project. 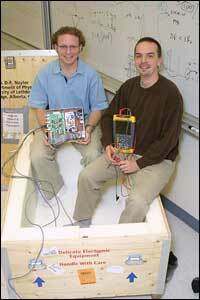 Graduate students Locke Spencer (left) and John Lindner spent 6 months at the SPIRE test lab in the UK. John Lindner and Locke Spencer, two graduate students at the University of Lethbridge, discuss their roles in contributing to the development of the SPIRE spectrometer. Click here to watch. Peter Davis-Imhof and Trevor Fulton explain how Canada helps to prepare the SPIRE instrument for launch. Click here to watch. Apple Quicktime required to view videos.